Rinse and dry the turkey, inside and out. Season with Adobo on the inside. Rub the turkey on the outside with achiote olive oil. For Pavochón, a pernil flavored turkey, season with 2 parts mashed fresh garlic (ok to use garlic powder or coarse garlic), 1 part coarse sea salt, 1 part coarse black pepper, and 1 part dried oregano leaf. Determine how much seasoning by the weight of the turkey. 1 tsp salt per pound and then figure it out. 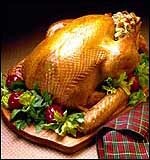 If your turkey weighs 10 lbs then 10 tsps salt, 10 tsps black pepper, 10 tsps oregano, and 20 (yes 20) tsps garlic. Or measure by ¼ cups. Mix ingredients with a bit of olive oil and a packet of Sazón with achioto and rub liberaly on turkey. If you are not going to stuff the turkey put a large onion, cleaned and skinned, sliced in half and a whole head of garlic, peeled (as much as possible) with the top sliced off, in the cavity of the turkey and one banana leaf. Line the bottom of the pan with 3 or 4 banana leaves. Cover turkey with banana leaves and at the end remove the top leaves to allow turkey to brown nicely (you might need to raise the temperature a bit to brown it. Serve on a bed of banana leaves. Your house will smell devine and your turkey will be delicious. Mashed potatoes sprinkled with garlic powder or freshly mashed garlic. In a caldero cook ½ pound of bacon until crispy. Remove the cooked bacon and chop into small pieces. In the bacon fat stir-fry ½ cup of sofrito for a couple of minutes or so. Add the cooked bacon. Add 1(8oz) can tomato sauce, 1(16oz) can pinto beans, 1 (16oz) can measure of raw rice, and 1(16oz) can beef or chicken broth. Stir well. Add enough water to cover rice 1½ inches above rice line. Let it boil on high until water evaporates. Cover and cook over low heat for about 25 minutes. Pastelon de Platano Maduro - surprise your friends with this easy to prepare island delight. (not a traditional Puerto Rican dish, but if you're making pasta salad, make it island flavored. Puerto Rican style green salad. Use leaf lettuce, thinly sliced onions and tomatoes, canned corn and peas - drained. Plate and sprinkle with vinegar and oil dressing. Cazuela ( a real Puerto Rican dessert made with coconut and pumpkin and easy as 1, 2 ,3 !